At AVer we have a saying that the classroom is always changing. From things like Interactive Flat Panels, Classroom Video Conferencing Systems, and remote and tablet learning, students today spend more time around technology than ever, all while having access to an entire world of information at their fingertips thanks to the internet. With massive new disruptive tools and big leaps in classroom technology over the last two decades you can imagine that today’s modern classroom looks nothing like the classroom that you went to school in. Technology isn’t the only thing; however, that is changing the classroom. Let’s put our future seeing glasses on and see where the classroom of the future may be headed. STEM and STEAM programs are in the news a lot these days. If you haven’t heard about these program initiatives before they stand for Science, Technology, Engineering, and Math and the most recent addition of the ‘A’ for Art. Huge government and private funding initiatives for STEAM projects have taken place recently, such as these in the United States and Australia, and they look poised to inject a huge amount of money and resources behind implementing these programs. Although, the benefits of this cash injection may not be immediately felt we can expect schools will be all too happy to take advantage of these programs to modernize outdated classrooms with current available technologies. This funding will also give rise to new ideas and companies looking to provide more future solutions to classrooms. Think of things like augmented and virtual reality in the classroom and how they will be used to teach in engineering or robotics classes. 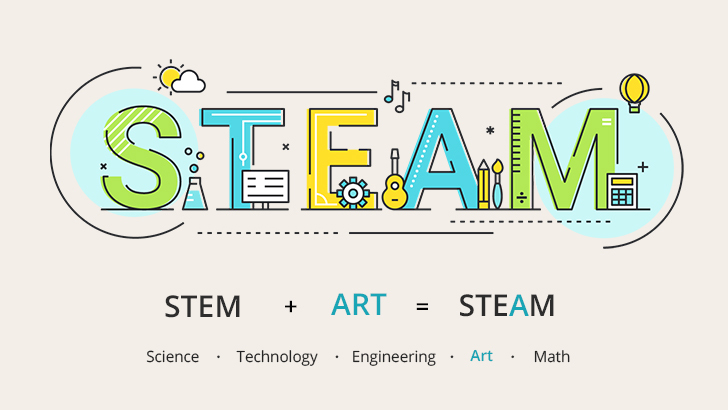 We can venture that over the next 5 years or so that STEAM programs will really begin to grow and that the technologies and innovations that will become available, with the assistance of these programs, will bring rise to an entirely different sort of classroom. What do you know? The blackboard is gone. What’s taken its place? An Interactive Flat Panel. The classrooms of tomorrow will be a much more interactive and connected experience than your traditional classroom of 20 years ago. We are already beginning to see things that we once considered a classroom staple being replaced by exciting technologies. Paper, for example, has quickly become replaced by laptops and tablets and even in some places teachers are being replaced by an educator calling in from across the globe. Here’s a simple example of how this change will be so important to the future classroom and it comes down to one word ‘Connectivity’. I mentioned above about tablet and remote learning. 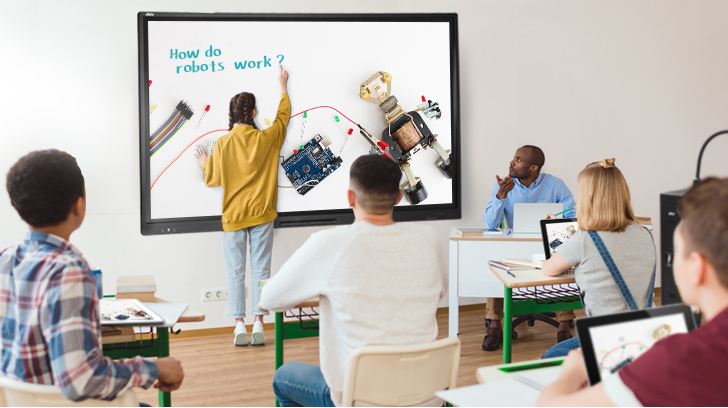 This is an area that is a prime for expansion and the latest generations of Interactive Flat Panels are beginning to offer ways for teachers to immediately connect with students, through features like screen sharing and classroom scheduling systems, directly through their classroom devices. 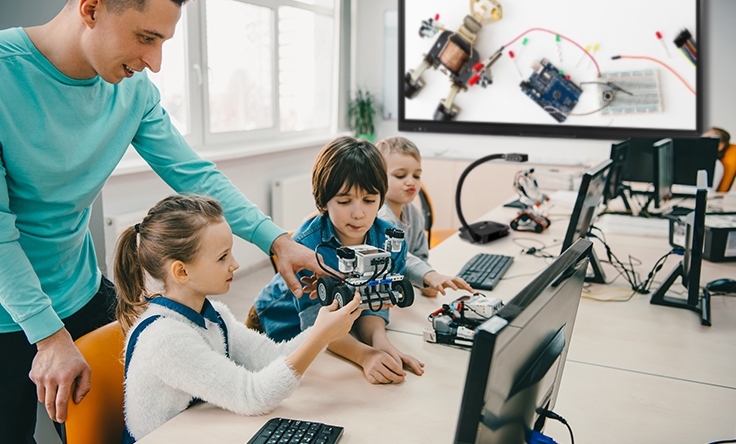 These types of technologies are going to become more and more integral to the classroom ecosystem and the connection between the front of the classroom and students will continue to grow. In order for the future classroom to meet the expected needs of future learners, technology must not only provide more connectivity and engagement, but also allow learners to experience the technology that will most likely play a larger part in their daily lives as they grow up. For this reason, it is a safe bet that we can expect this trend to grow at a faster pace. This one will be a true game changer. Incorporating new techniques and new tools into the teaching curriculum is one of the most important features of the future classroom. There are great examples of current teaching techniques being used right now. For example, Lego has released new sets of training blocks. These blocks aren’t aimed at toddlers though. They are designed for helping students understand STEAM subjects. 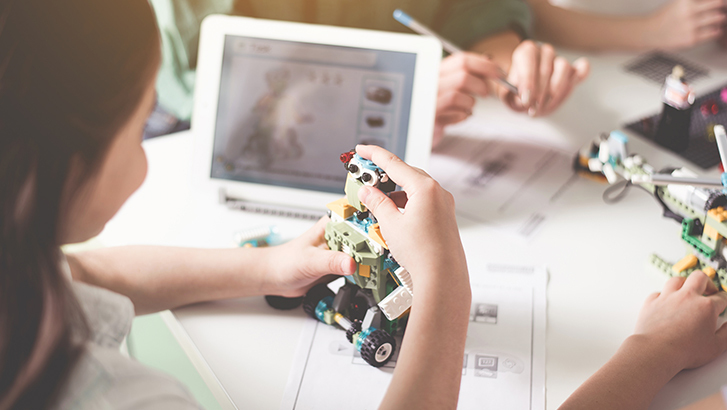 Students can learn about engineering, coding, and robotics and how to implement them in a fun way (every kid loves Lego). Teachers can be expected to find even more ways for students to learn or express their creativity through innovative teaching programs as the understanding of these new tools becomes greater. Other outside the box methods of teaching are also rapidly expanding. Remote learning will become more common place and teachers and/or students will be calling into classes from hundreds of miles away. It is up to schools and teachers to best find curriculums that can make the most out of this new adaptive education style. We can also expect the presentation and display equipment available to teachers and students to greatly change. Right now interactive visualizers fill this role quite well, but as display equipment evolves into the virtual and augmented world presentation equipment will also need to evolve to cope with this new technology. Imagine what it will be like to scan objects and digitally load them unto a class' AR/VR headsets. A very exciting prospect! There are many driving forces behind the evolution of the classroom over the past several decades. We now stand on the verge of truly experiencing what EdTech promises to bring to the classroom. With all hopes within the next five years the classrooms of today will look as different as the ones from twenty years ago.